I know the whole baking world’s gone a bit mac-mad but you know, I just don’t really get what all the fuss is about. 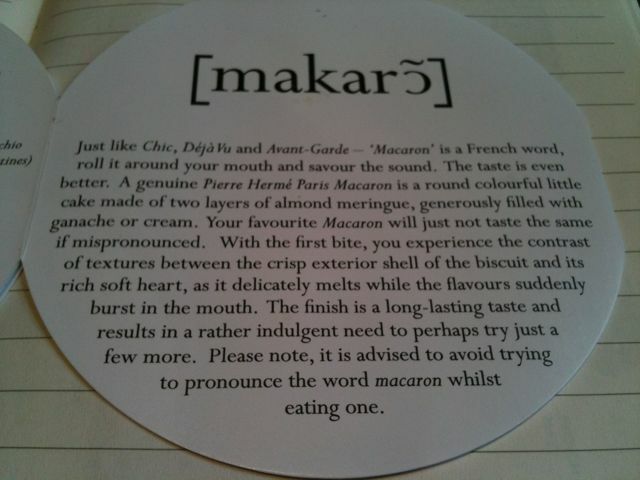 To me, macaroons seem a bit uptight, definitely too pretentious to be my ideal cake. And I feel downright queasy about all the artificial colours and flavours that go into them. Also, while I’m getting this off my chest, I suspect a cabal of po-faced French patissiers of whipping home cooks into a frenzy of inadequacy over something which is, after all, a jumped-up meringue. IThe truth is they’re not actually that difficult to make – Laura and I make them for our Uparwali Chai tea parties and neither of us have ever set foot inside the Cordon Bleu. 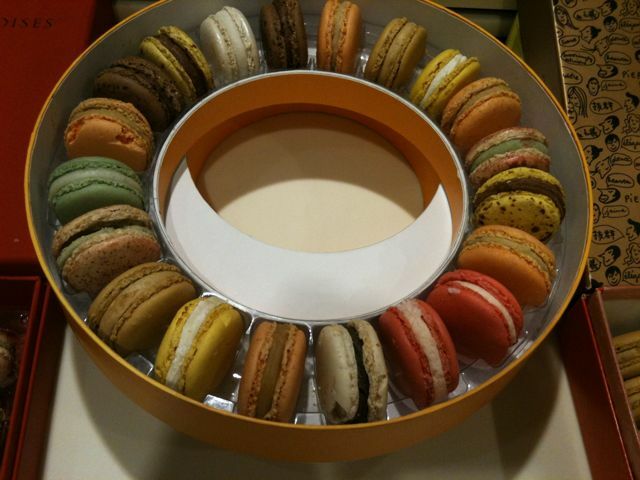 We’ve been hearing a lot about a macaronnier called Pierre Hermé recently – he’s apparently won the Parisian battle of the macs and robbed Ladurée of the title Macaroon King. 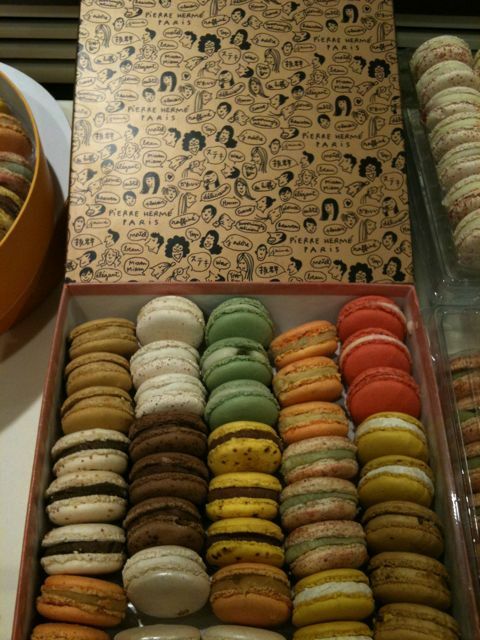 Laduree has had a shop in Harrods for some time and Hermé has just recently opened one to huge fanfare in Selfridges. As I was walking past Selfridges the other day (being dragged to Primark by my teenage daughter), I couldn’t resist having a look. 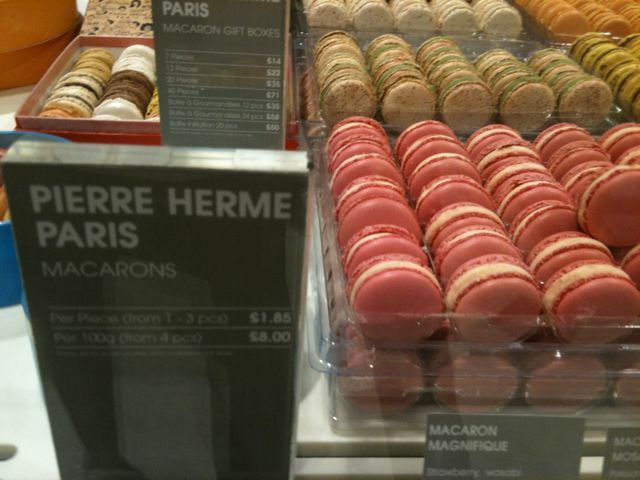 Hermé has a very fetching display in the food hall, staffed by extremely reverential young men who explain the flavours to you in a rather disdainful manner – ‘But Madame, how could you not know that ‘Arabesque’ means apricot and pistachio?’. I’m a sucker for a craze, though, and bought a box anyway, (£14 for 7!). Yeah that’s kind of pretentious. But I am a big macaroon fan; I think to Australians they really represent the absolute pinnacle of the Euro flair and sophistication we strive for but never quite achieve. Canapay, anyone? this very grateful blog and informatic i want to bookmark it . Eccles cakes. Yes please, Pam. This is very greatful and informatic helpful Can I quote a post in your blog with the link to you? i want to book mark it ! india tours, india tour packages, india tourism, india travel, indian tour, india travel packages, tourism in india! Lovely post! As a food blogger myself, you might be interested in attending the International Food Bloggers Conference on August 27-29,2010 by Foodista. You may also seek for sponsorship if you are having funding difficulties. For more details, check this page out. Hi Nigel, I need it to cool down a bit for that kind of palaver! Kiran – paying for it now, though, waistbands are decidedly pinching! Desiderata – also, somehow lacking in substance though! Since I’ve just discovered your delightful blog today, you’ll probably see a whole bunch of comments from me in one day! Did make my first pistachio macs yesterday, nothing complicated , but so sad looking, absolutely flat, no feet! They tasted quite yummy so sandwiched them with choc ganache atop fresh mango icecream and served them with a smile and a heavy heart! Family loved them tho’ and polished of the whole batch in a blink!